How can I safely store my CD's and DVD's? Damage that occurs on the “read” side of your CD (the unprinted, silvery side) can prevent your CD or DVD from being correctly read. Scratches can interfere with the reading, as can dirt, or even the grease from your fingertips. It only takes a small amount of damage before a disc starts skipping or ceases to play entirely. Damage can also occur to the aluminized (label) side of the CD or DVD. If the aluminized side, which is normally protected by a layer of acrylic, is exposed to oxygen, it creates aluminum oxide, which cannot reflect the reading laser beam. CDs and DVDS can both be damaged by heat or pressure, which will warp them. Ideally, you would keep your CDs and DVDs in jewel cases or any other box that uses a central snap device to store the media. Jewel cases are designed so that not only are CDs and DVDs protected from airborne irritants and clumsy handling, the CD inside never touches a surface except for the snap in the center. t's best if you store your CD's and DVD's each in separate jewel box then place the cases upright, much like books in a library. Storing them flat won't typically be a problem if they are in a case and as long as you don't place something heavy on the case. To ensure CD longevity, do not store CD's or DVD's, even in a jewel case, in direct sunlight, as this can cause them to bend and warp. Conversely, if you leave a CD in your car in freezing temperatures, you should let it warm up a bit before playing it. 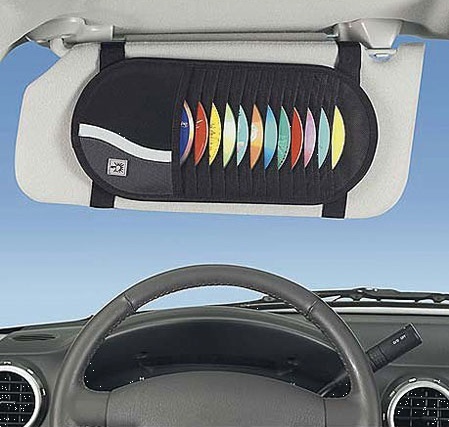 If you keep CDs in your car, you need to have some sort of CD storage that allows you to easily access your CDs and still keep an eye on the road. I've never really liked CD wallets, the kind with pages of bound sleeves with pockets, because they're too difficult to fumble when trying to find specific discs. Instead, I prefer the flat, organizers that are attached with Velcro straps to the sun visor. The slots are soft and padded to prevent scratches and discs can be arranged so that the label is exposed for easy identification. Prev CD's & DVD's How Long Do They Last? Next How Do I Use NVU to Edit My Dreamhost Website?